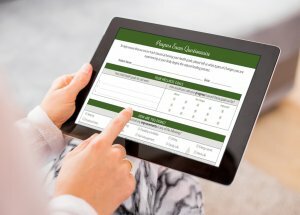 Our First Impressions Pro forms are available in digital format so that you can upload them to your practice website or use them in any way an Adobe PDF file can be used! Simple by design. 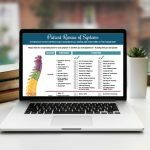 Our forms were carefully developed through a 6-month collaboration between dozens of chiropractors and patients ensure that each form collects only the most pertinent information needed. Nothing more. Nothing less. They’re clean, functional, professional, and patient-friendly. Save time and improve your on-boarding experience for both new practice members, yourself and your staff alike. Bundle Special – Get all five digital forms and save! Fillable PDFs can be completed on any device, then emailed to you for ultimate convenience! Perfect for phone consults or busy practices where reviewing patient intake forms in advance is crucial. Universal file format of an Adobe PDF means that you can integrate your digital forms in ANY way that a PDF can be used! For ultimate flexibility to fit your systems and procedures. Customized with your own practice info at no additional cost! Your online brand is important. We’ll ensure your contact info is on each digital form. Printed forms are also available separately on high quality paper and a great value! Digital is great in many cases. But nothing makes a better first impression than full-color, full-bleed forms on high quality paper. The Digital First Impressions Pro Bundle is the best value for your digital needs. Get all 5 digital forms customized for your website for 20% off individual prices, plus add the optional printed Forms Starter Pack for additional savings. Individual Digital Forms also on sale! 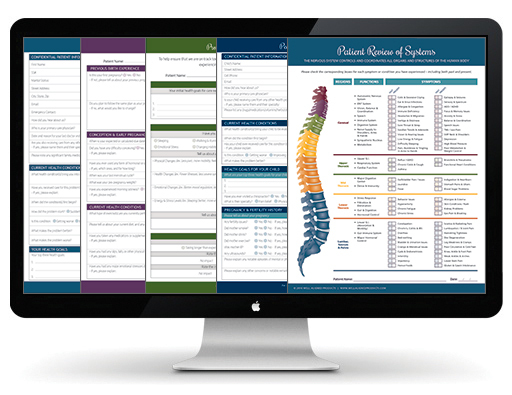 Individual forms are also available for chiropractors that don’t need all five forms in the Digital Forms Bundle. Individual forms features all the same benefits and customization – but do not include the optional 50% discount on printed forms. Only $99 each for individual forms! What is included with the Digital Forms Bundle? You’ll get everything you need to streamline your new patient experience and integrate digital forms into your practice. 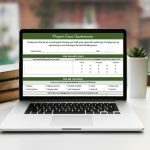 Not only will you get each individual PDF, but you’ll also receive a .zip file with the following bundled forms for ultimate convenience for both you and your new practice members! All five fillable forms customized with your practice info delivered as separate PDF files. Adult Intake Pack includes Adult Intake + Patient Review of Systems in a single PDF. Peds Intake Pack includes Pediatric Intake + Patient Review of Systems in a single PDF. Pregnancy Intake Pack includes Adult Intake + Patient Review + Pregnancy Intake. How can Digital Forms be used in my practice? Emailed forms: Don’t want them on your website? You could also email the PDF files to your new patients and follow the same save > attach > email process. Using a tablet: Many WAP customers have patients fill their forms out in the practice using an office iPad or other tablet. It’s a great user experience, and allows your CA or staff to answer any questions that patients may have. Printing digital forms: If new patients are having technical issues with saving and emailing their forms, they can simply print them and bring them at the time of their appointment. Can patients complete and submit the forms online? We can create forms that include a “Submit” button that is linked to your preferred email address. There is an additional cost of $50 to add this option to the standard PDF files that are included with WAP forms. If you would like to implement this option, you can have your developer or website provider integrate the forms directly onto your website. It’s great when it works – but includes the risk of compatibility issues with your patient’s device, browser or experience level. If you would like to use your forms this way, you will have the option to add a second set of forms with “Submit” buttons for $50 after your initial purchase. Important: As of July 2018, we do not recommend this option, nor do we have the technical staff to support the variety of systems and user experience required to successfully use the forms in this manner at this time. Can I print the digital forms for new practice members? What level of customization is available? Customization is limited to adding your preferred practice and contact info to the bottom of each digital form. You will receive a link to a customization form at the time of purchase. We will them add that info to your digital forms prior to sending them to you. Sorry – we cannot edit, add or delete questions on forms without additional costs – but we do offer metric versions for our friends in Canada and abroad! If you have special requests about certain elements of the forms, please ask. We’ll create a cost estimate for you for the custom graphic design required. Do your forms integrate with ChiroTouch or other software systems? Not at this time. If the demand grows, we’ll have a stronger case for CT and other systems to write the code to integrate patient data from WAP forms. Do you recommend an application for our new practice members to use when completing their digital intake forms? Yes, while there are dozens of applications that work, we recommend including a link to the free download of Adobe Reader when sending your digital forms to new practice members. It is a free download, and always includes the most recent compatibility updates from Adobe. Well Aligned Products is not able to assist with implementing the PDF files with your website or systems. Digital sales are limited to a .zip file with all the fillable PDFs for each form purchased. No technical support available. Digital forms will be emailed as fillable PDF files within 5 business days of completing the customization form that will be provided after checkout. Digital products are non-refundable once the customization form has been submitted and custom graphic design has begun.